Jean Chatzky on the Big Shift to Women in Financial Power | Pure Financial Advisors, Inc.
Jean Chatzky (NBC’s Today Show) talks about HerMoney.com, her new project giving women the confidence to lead the charge into the financial future. Plus, what women get wrong about money, how automation can help our health and our wealth, and why the gig economy isn’t helping. Joe and Big Al discuss the Uber IPO, taking RMDs from your IRAs, the pros and cons of paying all cash for real estate investments, the pros and cons of 1099 versus W2 employment, and why one woman’s “personal tax shelter” was rejected in tax court. 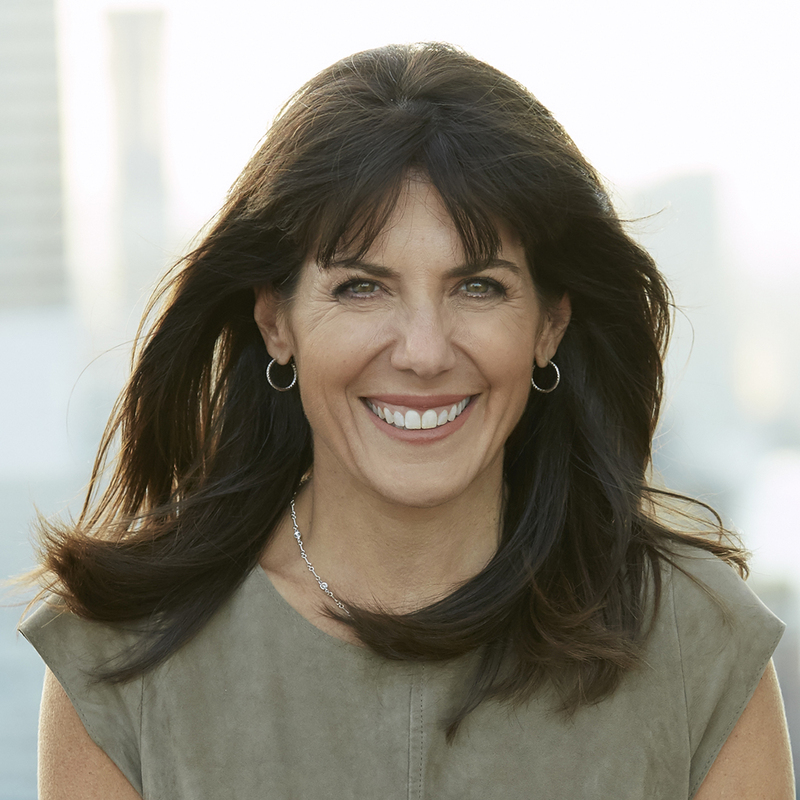 Today show financial editor Jean Chatzky joins us this week on Your Money, Your Wealth to talk about HerMoney – no, not Jean’s personal bank account, HerMoney.com – a new multimedia project giving women the confidence we need as we lead the charge into the financial future. Jean shares what women get wrong when it comes to money, how automation can help our health and our wealth, and why the gig economy isn’t helping. Plus, Uber is going IPO, taking RMDs from your IRAs, the pros and cons of paying all cash for real estate investments, the pros and cons of 1099 versus W2 employment, and why one woman’s “personal tax shelter” was rejected in tax court. Now, here are Joe Anderson, CFP® – and sitting in for Big Al Clopine, CPA for a few minutes, I’m Your Money, Your Wealth® producer Andi Last. JA: Big Al has stepped out of the room. So Andi Last, can you believe that you’re doing this? AL: I can. Actually, I’m really excited to be finally getting the chance to do this. JA: Because we have probably the biggest guests we’ve ever had on the show. AL: You got that right. JA: So why don’t you introduce our guest? AL: Ms. Jean Chatzky. She is the financial editor of NBC’s Today Show. She’s AARP’s personal finance ambassador. She’s an award-winning personal finance journalist, and the founder and CEO of HerMoney, which is a multimedia company changing the relationships that we women have with money. And that is inspired by her weekly podcast, which is HerMoney with Jean Chatzky. Jean, thank you so much for taking the time out to join us today. JC: Well thank you for having me. I’m happy to be here. AL: I saw you at FinCon and it was great to meet you in person and to hear you speak. And one of the exciting things that you spoke about at FinCon was the rise of women. So let’s talk about that a little bit. Tell us a little bit about how women are going to be rising in the next several years. JC: So when you look at all or most of the demographic trends, women are leading the charge. It’s true that we have not closed the salary gap yet. We are working on that. But for every hundred men who graduated from college last year, 132 women graduated. Already half of all millionaires are women, but more are coming. Women are going to inherit 70% of the $41 trillion that will transfer in intergenerational wealth over the next 40 years because we inherit both from our husbands and from our parents. And by 2028, women will control 75% of the discretionary spending around the world. So it is big. It is a big shift, and it’s coming really quickly. JC: None at all. None at all. Look, we want to give women a comfortable place to learn this important life skill and to get comfortable with this important life skill. We did some research for the launch of HerMoney. What we heard from women is that 80% of us say we are savvy and informed shoppers. 70% say we are savvy and informed voters, and savvy and informed patients – we know what we’re doing when we go to the doctor. We know how to ask our questions. Only 30% of us feel like we’re savvy and informed investors, and that’s just not OK, because if you look at the other demographic statistics and facts around women, the fact that we continue to earn less than men do right now, and as a result, amass less money in our retirement accounts, when we get to retirement, we live longer. And we have to make all of that money last a longer period of time. That requires us to be good investors and to be in the game. And right now, far too many women are sitting with big balances in our savings accounts, not confident enough to put that money to work. So what we’re doing with HerHoney is closing that confidence gap. JA: You know, that’s a really good point because with the whole behavioral finance statistics that is coming to the forefront, and one big bias is overconfidence. Do you believe that males have more overconfidence than females? Because we’ll have female clients come in and they have millions, and they’re still really worried about being on the street. Versus a male will come in with maybe a half a million dollars that’s spending way too much money and has all the confidence in the world that things will work out. JC: Yeah, I think you put your finger on it. We both correct a little bit too much in the wrong direction. So men may be a little too overconfident, women are not confident enough. There are many women who are fine investors – who are very good investors. We just haven’t allowed ourselves to accept the fact that what we’re doing by putting money into our retirement accounts every single time we get paid, investing that money in a diversified portfolio, not touching it when the markets get volatile makes us a good investor. It does, we just don’t quite grasp that. JA: Well let’s talk a little bit about the HerMoney podcast because that’s also available through HerMoney.com. You’re not just specifically focused on investing, you talk about all sorts of financial issues for women, isn’t that true? AL: Jean, let me ask you – what are a couple of things that you would say are the main issues, money issues, that women get wrong? JC: I think the biggest is, and this is just true for women, it’s certainly true for me in many aspects of life. I like to know the answer to every question before I take action. And where money is concerned, sometimes there is a correct answer. What’s the best credit card available right now if you want to collect frequent flyer miles? I can answer that, right? And I can answer it correctly. What’s the best stock? I can’t answer that question. What’s the market going to do next month, next year? I can’t answer that question. I can’t answer it perfectly. And when we require ourselves to give perfect answers to these questions for which no perfect answer exists, sometimes we get stuck – and getting stuck is the mistake. You’ve got to figure out a way to get yourself to take action anyway, and get comfortable along the way with the imperfection of the process. AL: So what do you see happening with HerMoney.com? What’s the future of this wonderful website for women? JC: Thank you. We are publishing new content every day. We’ve got a great newsletter, it goes out twice a week that helps you keep up with what is happening in the world with your money. We’ve got HerMoney happy hours that we are doing live across the country, meeting our viewers and our readers, so that we can hear firsthand what’s on their minds and more podcasts, more – just more. More more more, so we hope that your listeners will subscribe, and will subscribe to the newsletters, maybe join us on our private Facebook page where we’ve got thousands of women talking about money every day. JA: Jean, I want to ask you a question on your latest book Age Proof: Living Longer Without Running Out of Money or Breaking a Hip. JC: Right. And I cannot take credit for that breaking a hip part, but I did write this book with a doctor. I wrote it with a doctor named Michael Roizen, who is the chief of wellness at the Cleveland Clinic. He is a genius. But what we determined along the way was that you don’t need a totally different toolkit to get strong in your health and your finances. Many of the same strategies work for both. JA: Yeah, I think it’s equally important if not more. I mean, I think if you have all the money in the world and you’re miserable and you’re not healthy, either mentally or physically, what’s it all for? So those two go such hand in hand, and I thought it was an awesome idea to put those two together. Losing weight and getting in shape is a billion, trillion dollar industry. But it’s fairly simple. You just got to get a little sleep, maybe work out a little bit, and eat healthy. We all know that. But the execution is almost impossible. JC: Well, it’s the same with money. Right? It is the same with money because we’re human. And when you think about this task of eating less and exercising more, it requires you to give something up. It requires you to give up the chocolate cake that you want right now. JC: Yeah I know. It requires you to delay gratification. And the same is true when we’re asking people to consistently spend a little less and save a little more. JA: What do you think people can do? Because I know there have been studies. I think Merrill Lynch did this a while ago. If they saw a picture of themselves 20 years in the future, that they were a little bit older, a little bit grayer, a little bit wrinklier – then all of a sudden they would save a little bit more money, because they were taking care of that future self. What are some tips and tricks that potentially you can give us to think about our future self, and not be so concentrated on our today self? JC: So the visualization really does help. I don’t know if you ever did that Merrill Lynch exercise where you age yourself. I think the app was called PhotoBooth or something like that. But I did it, and it was really, really scary. So yeah, you should, everybody should – because I called the researchers and I asked them if I could just look at a picture of my mother because I love my mother, I kinda look like my mother. And they were like, “no! You have to look at yourself.” So I did it. I’ll never do it again. (laughs) But you can use techniques like visualization in other ways – you can visualize your goals. It does help to make your goals tactical, to be able to see them, name them, know when you want them. That said, nothing works like automation. And automation is the best tool that we have for financial success. It works better in money that it works in health. I mean, Dr. Roizen has me convinced that you actually can automate some of your eating. If you can figure out a couple of breakfasts and a couple of lunches that you like well enough to have on a regular basis and just keep them around – this is why you will always find Siggi’s yogurt in my fridge, cuz I can eat it for pretty much any meal of the day. I can like it pretty much any time I eat it, and its grab and go. If you automate your financial decisions, automate your savings for each and every goal, and put that at the top of your priorities list – as long as you are satisfying your savings goals, it almost doesn’t matter what you do with the rest. JA: Yeah that’s so well said because I think people get it the opposite. You’ve got to pay yourself first then spend everything, right? You don’t need to just hover and stress over a budget. If you figure out what that savings goal is, do that, spend everything else. I think more people would be financially secure. But we end up saving last. It’s like, well everything else has to be paid first and then we put ourselves last. So if we could just flip the switch there a little bit, you’re right. I think more and more people would find that it’s not as difficult to save, once they just get in that habit. JC: And the nice thing about getting in the habit is that getting in the habit is, in and of itself, a confidence booster. So one of the things that I do, that I find I take a lot of joy in, is visiting my savings. I go on a grand tour. I’m a big believer in mental accounting, and what that means in my life is that I save separately for a lot of different goals. I just have – you know, your bank will allow you to open as many savings accounts as you want. Once you’ve got your minimum balance they don’t charge you extra. So I just open them for my various goals, and then I visit them. And it’s nice to go on a tour and see, “ooh, my 529 is here, and my 401(k) is here, and my rollover IRA is here.” And just to take heart in the fact that you’re making progress toward whatever your goals are. I did a big survey of money and happiness a while ago for a book that I wrote, and what we learned in the research is that getting to the goal is, in some cases, even a little bit of a letdown. It’s the process of going that makes people really happy and really satisfied. AL: Jean, I would like to ask you a little bit more about your presentation at FinCon where you talked about the big money ideas for the next five to 10 years. Specifically, I want to talk to you about “work that really works.” Can you tell us a little more about that? JC: Sure. So I was focusing on the fact that 90% of the increase in jobs over the last decade has been in alternative forms of employment. We’re talking about gig work and freelance work and temporary work. The problem with that is, our whole social safety net grew up around the idea of full-time work. You know, jobs came with health insurance and retirement and training and retraining and, maybe if you were lucky, you even that stock in the company. And today we’ve got all these gigs that don’t provide those things. And when we read stories in the paper about income inequality, I think what we have to step back and remember is that the gig economy isn’t helping. That income inequality is a year to year symptom, but wealth inequality, because you don’t have an employer who is nudging you to put money in a 401(k) and matching your contributions, is a longer-lasting and growing problem. And what it means is that you’re not, unless you’re doing these things for yourself, you’re not building this foundation that’s going to allow you to jump from one job to another. And so what I think we will see, and it’s funny, right before FinCon there was a story in the paper about AirBnB and how they are considering giving shares of stock to the people who run AirBnBs. And that’s what I’m talking about – that we’re going to have to start to see a transfer, not just of income, but of ownership if the gig economy is going to be sufficient to actually support people long term. JA: You know, just piggybacking off that. You’ve got the gig economy where maybe I’m very successful within my gig and I make hundreds of thousands of dollars a year. But then I have to put together my own 401(k) plan, or I have to put together my own benefits plan, which is just another layer of sophistication, because maybe I’m really good at a certain activity, but not necessarily the finance aspect of it. And I think you’re absolutely right because we see individuals, you’ve got Tom and Harry, or Julie and Jane, they work for very similar industries, they make the same amount of money. They have the same sophistication level. But if one person has a 401(k) plan at their employer and the other one does not, in the next 20 years if they stayed with that employer, who’s going to have more money saved? In most cases the person with the 401(k) plan, because it’s so easy – it’s just out of sight, out of mind. I just check a box and the money goes in. For the other individual, they have to do a lot more legwork and some work that might be uncomfortable or maybe intimidating for them, because they’re not very comfortable with money. So you’re absolutely right. I mean, I love the gig economy, and I’m not saying, “hey, if you’re an Uber driver you can’t make hundreds of thousands,” – well that would be pretty hard, you would have to drive all the time. But you’re right – they need to get a little bit more ownership and some equity and build that wealth. JC: Yeah I think that’s very, very well said. And there are service companies that are stepping up to sort of fill that gap. I see them advertised when I take the subway. “We can be your backend benefits provider,” right? But it’s just a matter of the entrepreneurs understanding that you can’t just take all this money that you’re making and use it to pay yourself and enjoy yourself. You have to build yourself a foundation for your future if nobody else is doing it for you. AL: Jean Chatzky, thank you so much for your time today. We really appreciate it. JC: My pleasure. Thank you so much for having me. AL: That is Jean Chatzky. She is the financial editor of NBC’s Today Show. 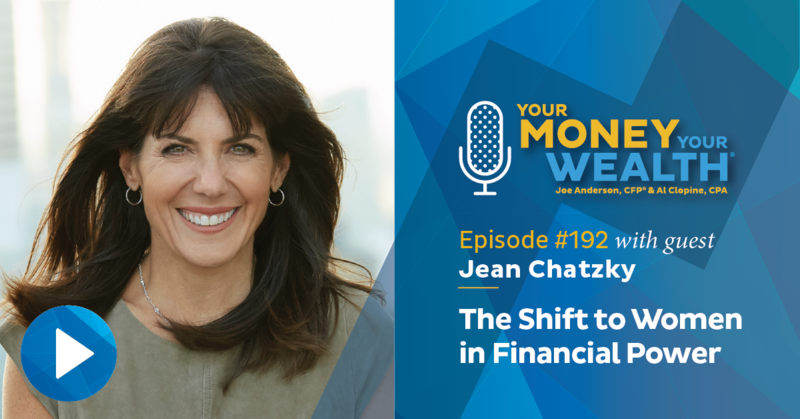 She’s AARP’s personal finance ambassador, she’s an award-winning personal finance journalist and founder and CEO of HerMoney.com – check out the HerMoney with Jean Chatzky podcast and sign up for the newsletter at HerMoney.com. Jean, thank you again. Now, Your Money, Your Wealth isn’t exactly the Today Show, but it is also a TV show! You can check out the latest episode, which happens to be on Retiring in a Gig Economy, at YourMoneyYourWealth.com – and just like the podcast, the TV show features the unique and entertaining personalities of Joe Anderson and Big Al Clopine! (clip) Be sure to subscribe on YouTube, new episodes of the Your Money, Your Wealth TV show are available every Sunday! JA: Andi Last was filling in for you, big guy. AC: Yeah. I missed the interview. It was great, I heard. JA: Jean Chatzky. She’s very famous. JA: You’ve never heard of her, have you? AL: Have you ever watched the Today Show. AL: She’s the financial editor for The Today Show. AC: Well that’s a morning show. So I’m working at that time. JA: Got it. We were talking a little bit about gig economies. And when I was walking in you guys were chatting, who was making $20 an hour? AC: Well we were talking about Uber drivers. JA: Did you know Uber is going to do an IPO next year? AC: I did not know that. JA: And you know what the valuation is? I think it’s Goldman and Morgan are trying to get a sweetheart deal to bring Uber to the public. Any guesses what that valuation would be? Uber. AC: Uber. Well, let’s see. Well because of the way you asked that I’ll say it’s probably high. So it’s over a billion. AC: $120 billion. Because they’re going to have Uber Air. They’ve got Uber Eats. Uber is going to try and take over the world. AC: So that’s worth it. JA: $120 billion, think about this. I was listening to a podcast and they were talking about the Big Three in Detroit. So that would be Ford, Chevy, and Chrysler? Is Chevy under Chrysler? AC: No it’s Chrysler I think. JA: Anyway, the Big Three auto manufacturers, they’re worth $120 billion. The 3 biggest! AL: That have been around for how long now? JA: And you’ve got Uber, it’s an app. (laughs) That’s how times are changing. AC: That seems a little overpriced to me. AL: I was telling Al that, in riding Uber all this week I got a driver who was a former mortgage broker and he told me that he’s got a spreadsheet and he figures out all the wear and tear on his car, and he still, if he works a 40 hour week driving Uber he’s making $900 t o$1,000 a week. JA: He’s driving a lot. JA: So what. Mortgage brokers probably make more than that. JA: What, helping people into homes?? AL: I’m telling you the man said. JA: You know how that works though, you retire and then you realize, “Oh, whoops I don’t really have enough income for retirement.” So then you go back to the gig economy. AL: And in between, he actually owned salon day spas in the Carolinas. So that’s what he actually retired from. The man was a bit of an entrepreneur. He was pretty cool. JA: He was driving Uber. So, pretty successful entrepreneur. AC: You can make $20 an hour I’m tellin’ ya. He makes a thousand bucks 40 hours a week. So that’s about $25 an hour. That’s not too bad. AL: And it gives him a chance to meet people and tell his story. AC: He’s social, so yeah. AC: This is from Tax Advisor Magazine. It’s a riveting magazine. (laughs) I can’t wait to read this article for you. But anyway… (laughs) I just saw this, it was a page turner. Couldn’t put it down. But anyway, I thought you might like it, Joe, and if you if you like it our listeners may or may not, I don’t know. (laughs) So. I thought that this strategy that this lady came up with – first of all, it was denied. But I liked her thinking. AL: So don’t try this at home? JA: She actually went to court and this was her case? AC: Yeah, that was her defense. JA: So she’s buying clothes and she’s donating them back?? AC: Yeah, so here’s what she did. So the charitable contribution, she went to a discount store, she used the Talbot’s, I guess, which I guess is a women’s clothing store, is that right? AC: Anyway, I guess they have really, in many cases, discounted prices. So she bought at the discounted prices and then claimed the charitable deduction for the full market value had she gone to another store, because that’s the fair market value. So let’s just say she spent 25 bucks on an item that you would normally buy for 50 bucks. So she paid 25 bucks and deducted 50 bucks. So I think that’s brilliant. But tax court said, “no way, you can’t do it.” I guess if you think about it, I mean that is true when you give away an item to charity it’s the fair market value, and you could literally – in some cases you buy an item like an old car and you fix it up, and now it’s worth more, and you give that away to charity. Yeah, it could be a higher deduction. AL: So does it say what the tax court’s rationale was for denying it? AC: Yeah I didn’t read that far. I was lying when I said it was a page turner. That’s as far as I got in the article. (laughs) That’s a good question though. Anyway, it’s an interesting idea – I’m sure the rationale, I’m going to guess now since I didn’t read the article, was the fact that if you pay 25 bucks then that’s the fair market value. For some legitimate charitable strategies and tax deductions as we approach the end of the year and you prepare to file your 2018 taxes, download our free 2018 Tax Planning Checklist for free – you’ll find the link in the show notes for today’s episode at YourMoneyYourWealth.com. It does not list all the crazy things people have tried and failed to write off, but it does reflect the changes from the Tax Cuts and Jobs Act, and it lists all the documents you need and items to review before you file your taxes for 2018. Find a link to the 2018 Tax Planning Checklist in the show notes at YourMoneyYourWealth.com. JA: We’ve got Bonnie. She’s a blogger at 40 through blue doors dot com. JA: What did I say? AC: I don’t know what you’re trying to say. JA: I don’t know either. OK. 43bluedoors.com. “Hello. I love your podcast and just finished listening to episode 188 with Cubert on real estate investing. AC: We have that many, huh? JA: I think we’ve got a lot more than that. All right. Well, thank you for listening, Bonnie. She listened to the episode with your boy Cubert on real estate investing. AC: That was kind of fun. AC: Is that what I said? AC: Well let me comment. Bonnie, I agree with your comment. If you can, I love putting all cash down. What happens, a couple of things, is your rate of return is less, generally, in an appreciating market, because you’re using all of your own money instead of borrowing other people’s money, but your risk goes way down too. And so if you can buy properties with all cash I’m all for it. I think that’s a great way to go. Most of us cannot. JA: Well, they cannot in San Diego. AC: Yeah. Because average property price here is probably $600,000 and a lot of the homes that you’re looking at would be a million dollars or more. JA: Sure. That would be probably not a really great investment for a rental. JA: The reason for that is that let’s say you get rents at what, let’s say a million dollar home – $3,000 rents? AC: 1% of $1 million It’s $10,000 times 12 months. You with me? JA: Got it, got it. Yes. AC: OK. So at any rate, if you live in a part of the country where your rents are 1% of the value then, to the extent you’re able, keep buying up properties. JA: Sure and there’s a ton of areas in the country where you can where you can do that. AC: Dallas maybe. Houston, Amarillo. (laughs) Let’s see, what else do we know in Texas? JA: So yeah. If you have multiple properties that you paid cash for, and then you’ve got to cap rate of 3, 4, 5%, then those are really good cash-on-cash properties. AC: In Texas, it can be 10%. AC: Yeah in some places. JA: Florida. Probably Minnesota. Iowa. AC: Tennessee. Minnesota for sure. AC: And I think I mentioned on the air that the problem with that is every guru that I’ve read their books on has gone bankrupt at least once. It’s because they bought this property A, they levered up to buy property B, levered up to buy property C. The next thing you know they had 20 properties and the market turned, and they couldn’t afford any of them. JA: So Bonnie. She’s a blogger at 43bluedoors.com. So yeah, I think we’re on the same page there. JA: We’ve got Bob Bob from San Diego. “I do have a question.” Thank you, Bob. “On your program last Sunday, you made…” what is that word? AC: That means strong. That means it’s a very strong point. AC: Yeah it’s a good add. So Bob, maybe you misunderstood what we said, because if you have IRAs, you can aggregate all the IRAs as if they had one account. You can take one RMD. However, when you have 401(k)s, 403(b)s, 457s, you have to take a required minimum distribution from each account separately, and you may have several if you worked with several employers and never rolled to an IRA. JA: Yeah. So he’s right. But I think sometimes when we say 401(k) or 403(b) or something like that, people think IRA. It’s a retirement account, IRA, whatever. But no, it’s very specific when it comes to RMDs. AC: Yeah, and that’s the maddening part is it seems like it shouldn’t be this complicated. JA: It is maddening. It’s so maddening! AC: And I’ll say an empathetic point. (laughs) It’s maddening! JA: I liked the verbiage, Bob. So hopefully that cleared that up. AC: He said Joe and Al. JA: lt just kind of blended. “I love your show. Thanks for all the valuable advice and guidance.” So here’s his question. Mac, I think I’m going to send you a bill for this one. AC: (laughs) It’s a long one. JA: “My wife is a dentist on W2 working for a private clinic and she does not get any benefits. Only this year after three years of service she got $10,000 in a SEP IRA from her employer, she won’t be able to contribute to this like she can with a 401(k). Also, this does cause some hindrance on doing backdoor Roth conversions.” Good for you, Mac. AC: Yeah that is a correct statement, so far so good. JA: “So I was looking for more retirement options for her and stumbled upon some videos on Mark Kohler’s YouTube channel.” First of all Mac, you can find all your retirement needs and videos right here at Your Money, Your Wealth®. AC: You don’t have to go to Mark Kohler. JA: I’ve never heard of Mark Kohler. I’m going to have to look him up. Fact check. AC: He’s probably better than us. JA: Way better. Mac probably turned our channel off and went to Mark Kohler. All right. Sparked his interest. “Thought of my wife switching to 1099.” Interesting. OK. So “her work is not supervised, she gets a percentage of her production, not hourly, and also no typical employer benefits – so no vacations, medical, dental insurance etc. So we could argue she is more like a 1099 employee than a W-2. However, I do realize it’s up to her employer to agree with this or not. The reason for switching to 1099 is that she might be able to reduce overall taxes and fund her solo 401(k) by having the LLC S-Corp.” See attached rough calculation!? Sorry, I don’t have that attached Mac. Thank you for sending me a spreadsheet that I can analyze for about 50 minutes for free. I’m kidding, of course. “Let me know your thoughts on the structure 1099 or W-2. This also could be a wonderful topic on your podcast.” Thank you, Mac, for your question. AC: And hence, we’re talking about it. So pros and cons. And first of all, your premise is correct, that it’s the employer that gets to decide this, not the employee. JA: But let’s just assume this: Mac goes and talks to the employer and says, “listen, my wife, for three years has been busting her tail. She’s a great dentist and you only gave her $10,000 in a retirement plan? We want to go 1099.” Her boss says, “Okay Mac, 1099.” There’s still pros and cons to it. AC: There are – so let’s talk about the cons first of all – the self-employment tax is double. So here’s what we mean by that. When you’re an employee you have 7.65% – we’ll call it 7.5% withheld from your paycheck, and your employer matches that. When you go 1099, you’re now the employee and the employer. So your self-employment tax that you pay is now 15% instead of 7.5%. So that’s that’s a downside. AC: 199A. 100 cap A deduction. (laughs) Anyway, let me backtrack. So if she gets $100,000 from this employer then seven and a half percent, $7,500, that would be the additional tax she would pay. If it’s a couple hundred thousand dollars, well, she gets over the Social Security cap, but there’s a Medicare that keeps on going, that’s a whole ‘nother discussion. But at any rate, there are higher taxes because of that. However, two pluses. One is you can do that Solo 401(k) as you mentioned, which is a bigger deduction than this SEP that she got. JA: She doesn’t even get the deduction because it’s an employer contribution and she’s the employee. JA: But let’s say married, under $300,000 of income; if you’re single, $150-160,000, as a dentist, married, combined salaries, if you’re over $300,000 Mac, congratulations, if you’re under, well then potentially this kind of weed in here. AC: That’s exactly right. So let’s go with the combined incomes under $300,000. Then your wife would take the gross income, let’s call it $100,000, just making up a number, and the expenses are $20,000. So $80,000 is the profits. So net profits. Now you get to take 20% of $80,000. $16,000. So that’s an additional deduction. It’s not a tax credit, it reduces your taxable income. And if your tax bracket, let’s just because of easy math, let’s say 20% – it’s really probably 22 or 24% – but 20% of $16,000 is $3,200. That’s your potential tax savings. JA: So you save $3,200 with a 199A deduction, but you also paid $7,500 additional. So your net is still negative. AC: You’re still negative unless you get a lot more into a 401(k). AC: (laughs) Probably as it turns out. JA: So you did all this work and you just lost $10,000 of free money from your employer. AC: Now if she’s making $200,000, that’s a whole different discussion because now she’s over the Social Security cap, which is what, $127,000 and change, somewhere around there. And so then it’s not a 15% tax, it’s a 3% tax – 2.9 to be exact. So maybe it now starts to make more sense. JA: Yeah but I bet Mark Kohler, whatever his name is, was saying – because I read he’s switching because he can do an S-corp, probably with some dividend allocations. So hey, why don’t I just have the wife pay $10,000 of salary and then the rest goes as dividends, and there is no self-employment tax on the dividend. AC: I think that’s what Mark was getting at – We had him on our show! He’s the Rich Dad Poor Dad Advisor. Remember that, years ago? You forgot. Anyway, he was on our show. AC: (laughs) No, not that guy. He was pretty animated, but I know who you’re talking about – I don’t remember his name, but no, he wasn’t that guy. AC: Yeah, you gotta get the pros and cons. JA: But he did put together a spreadsheet which I didn’t look at so I apologize but I think maybe you calculated all this for us. AC: Andi’s got a comment. AL: I was just going to mention this is going to go on YouTube as well! JA: So don’t listen to us! JA: Fact check it!! You’ve got to fact check the facts! That’s it for us. Want to thank Jean Chatzky, you can get her at HerMoney.com. Andi Last did a phenomenal job today, and for Big Al Clopine I’m Joe Anderson, the show is called Your Money, Your Wealth.